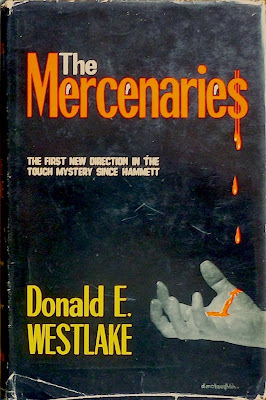 Ahead of my next run of spy fiction posts, let's return to crime fiction giant – and perennial Existential Ennui obsession – Donald E. Westlake, and his debut novel ("official" debut, that is; he had other pseudonymous sleaze works published before it), 1960's The Mercenaries, a signed, inscribed British first edition of which I blogged about just over a week ago. I mentioned in that post that Violent World of Parker proprietor Trent had already reviewed The Mercenaries – which was reissued under Westlake's originally intended title, The Cutie, by Hard Case Crime in 2009 (and also published as The Smashers by Dell in 1962) – in the course of which review Trent reasoned that the novel laid the groundwork for Westlake's Parker series (written, of course, as Richard Stark), which would commence just two years hence with The Hunter. It's a valid point. Certainly there are parallels to be drawn between the amorality of the Parker books and the amorality of The Mercenaries – at least as regards the bulk of the characters in the latter. The story is related in the first person by Clay, right-hand man of mob boss Ed Ganolese. Clay has been working for Ganolese ever since the mobster helped Clay out back when Clay was plain old George Clayton; as he explains to his squeeze, Ella, Clay is "Ed's boy, he's my boss, he says do, I do" – and that translates into anything from strong-arming to straight out murder. So when a stuttering junky known as Billy-Billy comes to Clay with a dead broad on his hands and the cops on his trail, and yet still protesting his innocence, Clay's first instinct is that Billy-Billy's days are probably numbered. Trouble is, Billy-Billy is connected, and it's in Ed Ganolese's interest to look out for Billy-Billy and find the real killer. Thus Clay must turn investigator, hunting down the unknown "Cutie" who set Billy-Billy up and is now leaving a trail of bodies behind him, in turn bringing down unwanted heat on the Organization. 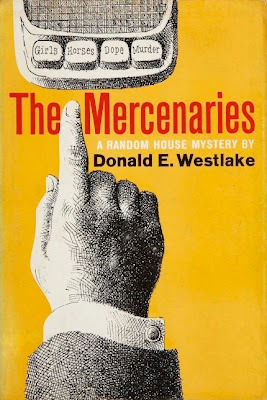 Much as he does in the Parker novels, in The Mercenaries Westlake immerses us in an utterly criminal world, with only Clay's girlfriend, the occasional walk-on cop and Clay's niggling conscience serving as moral compasses. But whereas in the Parkers Westlake reserves judgment on the rights and wrongs of Parker's lawless endeavours, in The Mercenaries there is a sense of the author disapproving of Clay. There's a strong suggestion that Clay will, in the end, get his comeuppance – something one never feels with Parker. Clay has his doubts about the life he leads, but they're ultimately fleeting: he's "Ed's boy", a lackey, and therefore quite different from the self-sufficient and consequently strangely admirable Parker. By comparison, there's little to admire about Clay, either on our part or, it seems, Westlake's. The milieu of New York mob life is well-realised. There's, if not an authenticity, then at least a plausibility, a believability to The Mercenaries. Although he was hardly the first author to have criminals as his protagonists – the likes of Jim Thompson, John D. MacDonald and, perhaps most significantly, Peter Rabe got there before him – Westlake's take on low level gangsterism is convincing. At root, however, The Mercenaries isn't really a gangster novel at all; it's a gumshoe tale, with Clay in the role of the P.I. 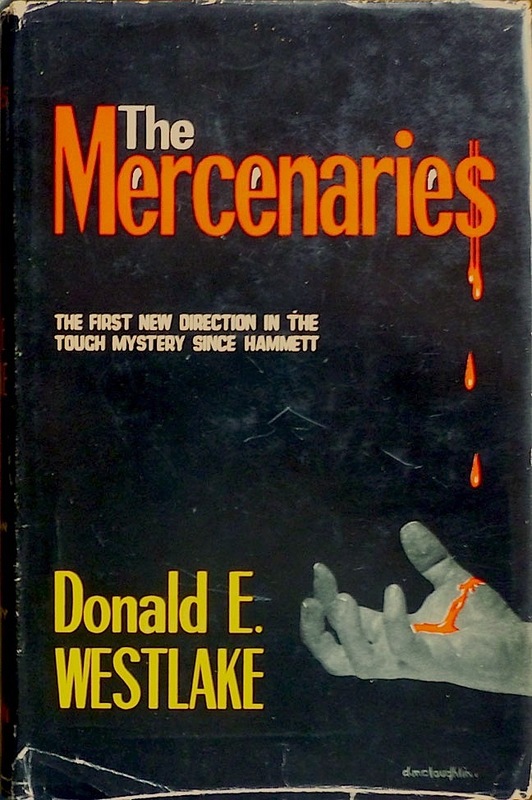 Good as The Mercenaries is, it's noticeably derivative, and it was only once Westlake managed to divest himself of the Hammett (overtly namechecked on the cover of the first British edition of the book) and Chandler trappings that he began to craft something more distinctive and original, in the shape of the Parker novels and, to a lesser degree, the Dortmunder books. To my mind, "The Mercenaries" is a more apt title than Westlake's preferred choice of "The Cutie"; the novel is populated by disagreeably venal characters, not least Clay himself. But the (almost) eponymous adversary does provide the impetus for events, and again could be seen as an indicator of things to come: in the way in which he wreaks merry havoc with Clay's life, the Cutie prefigures the anonymous foil who frustrates Parker in The Seventh (1966). As a debut novel, The Mercenaries has a lot going for it. It's a credible portrayal of a criminal underworld, disarmingly brutal in places, and a decent whodunnit to boot. And though in and of itself it's perhaps unremarkable – there were other writers doing similar things to more forceful effect around this period – it does offer tantalising glimpses of greatness to come. As such, it's an important book in Westlake's canon, and a milestone in his career as a writer. I haven't read nearly enough Westlake, but The Ax is one of my top crime novels of all time. Well I still haven't read The Ax, Kelly. Got a first edition waiting to be cracked. Lots of folk say it's one of his best. Have you read any of the Parkers?